Jay Ricker wants to be able to sell cold beer in his convenience stores, but Indiana law says it has to be warm. He's taking it to court. There's a battle brewing over cold beer in Indiana. The law allows only liquor stores to sell cold beer "to go" in the Hoosier state. But grocers and other stores, such as Kroger (KR), Wal-Mart (WMT), Costco (COST), CVS (CVS) and Walgreen (WAG), have to sell their beer warm. Now a group of Indiana stores is suing the state, and have also filed an appeal in federal court, hoping to change the law, which they say "lacks common sense." On the books since the early 1960's, the Indiana rule says that the temperature of beer sold in stores has to be warm, unless sold in liquor stores. Regular store owners say it hurts them. "Basically liquor stores have a monopoly," said Jay Ricker, owner of the Ricker's convenience store chain, and a plaintiff in the suit. "People want to grab a six pack and go home, and they expect products that are immediately consumable. That puts us at a disadvantage." A change in the law would also be good for consumers, store owners say, because competition would bring prices down. 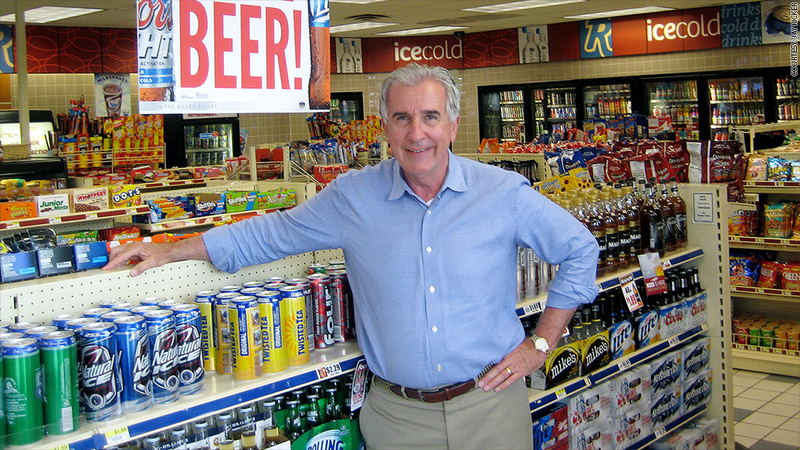 The average surcharge for cold beer is $1 at about 300 liquor stores surveyed by Scot Imus, who heads the Indiana Petroleum Marketers & Convenience Store Association, and represents more than 250 convenience store operators across the state, 90% of whom also sell gasoline. "The first thing that happens when you buy a case of beer at a liquor store is that the clerk touches it first to see if it's cold. If it's cold, they'll charge you more for it," Imus said. However, liquor store owners claim that the fight isn't about cold or warm beer, or about bringing the price of beer down. It's about national supermarket chains not wanting to be tied down by local alcohol rules. Liquor stores in Indiana require customers, and clerks, to be at least 21 years of age. Clerks also need to have their own permits, and be certified to sell beer -- rules that other retailers don't have to follow. It's safer, said Patrick Tamm of the Indiana Association of Beverage Retailers, a group that represents 1000 liquor stores. The reason why this fight is headed to court is also because cold beer is a business driver. Store owner Ricker said that when people pick up cold, rather than warm, beer they typically buy add-on items like chips, jerky, and other munchables. He points out that the law also doesn't apply to wine. Ricker is allowed to sell ice-cold wine, which typically has higher alcohol levels than beer. "Indiana needs to get out of the dark ages. Consumers should be able to get products when they need them," Ricker said.